According to Wikipedia, a Japa mala or Rosary is a set of beads commonly used by Hindus and Buddhists, usually made from 108 beads, though other numbers, usually divisible by 9, are also used. Malas are used for keeping count while reciting, chanting, or mentally repeating a mantra or the name or names of a deity in a practice known in Sanskrit as japa. For the worship and rituals of almost all the gods and goddesses, the Jaap or frequent Chanting of some mantras is compulsory with definite number according to the God and the Goddess each for the fulfillment of desires. For counting the number of chants rosaries are used. 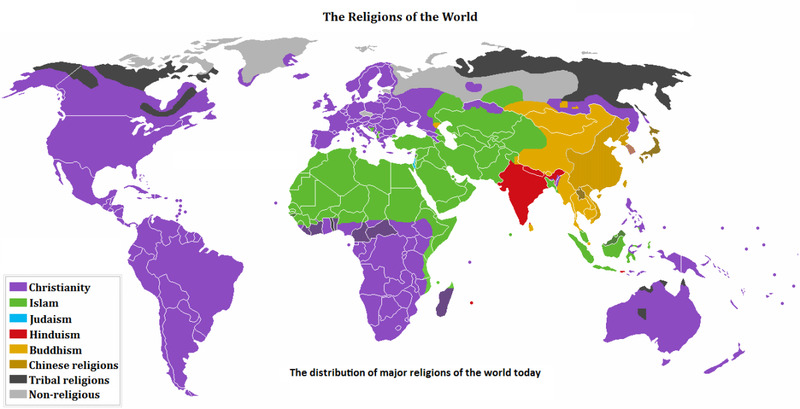 Given below are details of some popular hindu religious malas. There are many types of rosary or prayer beads used in Hinduism and Buddhism. Given below are details of some popular Hindu religious malas. 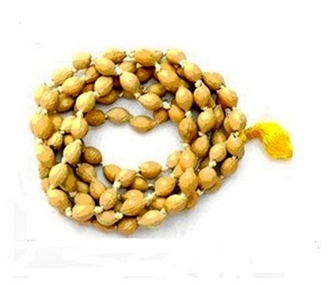 Lotus Seed Mala – Lotus Seed Mala is used for Goddess Lakshmi Japas and Sadhana. It is said that the Goddess is easily appeased if one uses this rosary for the chanting of her Mantra and she bestows upon him wealth and comforts. Turmeric Mala - Turmeric Mala is used to perform Anusthan or Special Prayers and to destroy enemies and succeed in law suits. It is said that by wearing turmeric mala Jaundice can be cured. 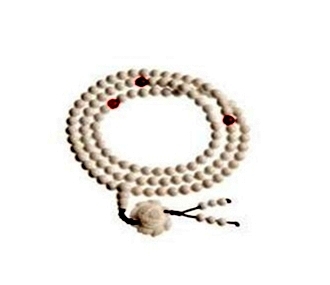 This mala attains peace of mind and gets rid of anxiety, depression and tensions. Putra Jeeva mala - Putra jeeva mala is also known as putra prapti mala and is made with the seeds of fruit of Putrajeeva tree. It is believed that this rosary has the power of bestowing the wearer with a son. Mantra of Jupiter, Sun or Santangopal and all those Mantras which are recited with the wish of having desired offspring can be recited on it. Coral Mala: It is used during sadhana or worship of Lord Ganesh, Hanuman, Lakshmi and Mars planet. It is also useful for people who are prone to anemic condition. 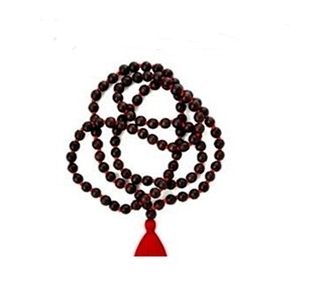 Red Coral has also been treasured for centuries by Tibetan Buddhists and is considered by them to be the most precious natural "stone," and the supreme mala material. 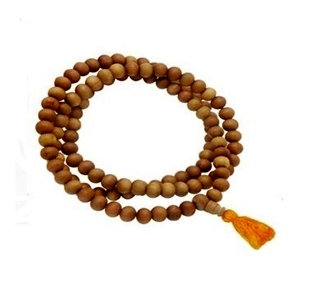 Sandalwood Mala – There are two types of sandalwood rosaries, red and white. 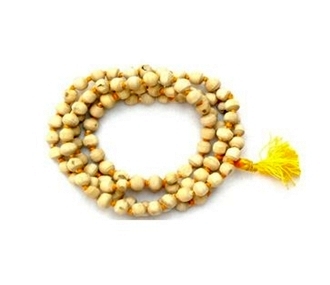 Mala made of white sandal wood is used for peace and empowering rituals and for worshiping ram and Vishnu. Sandal wood garland is also used for welcoming and for giving honor. 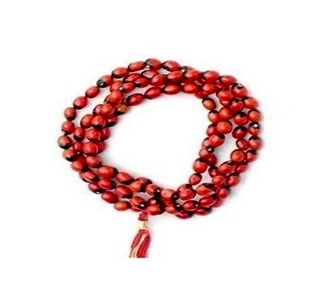 Red sandal wood mala is used in worship of Lord Ganesh and Goddesses. Tulsi Mala - Tulsi mala is used for worshiping Lord Vishnu, Ram and Krishna. According to Ayurveda, this mala is useful in diseases related to throat and purification of the body. Conch Mala - Shankhas or Conch are very lucky and dear to the Goddess of wealth Mahalakshmi. 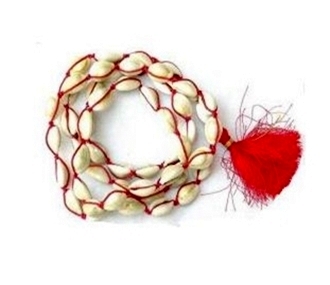 Shankha mala can be used in Mahalakshmi sadhana as well as other sadhanas. 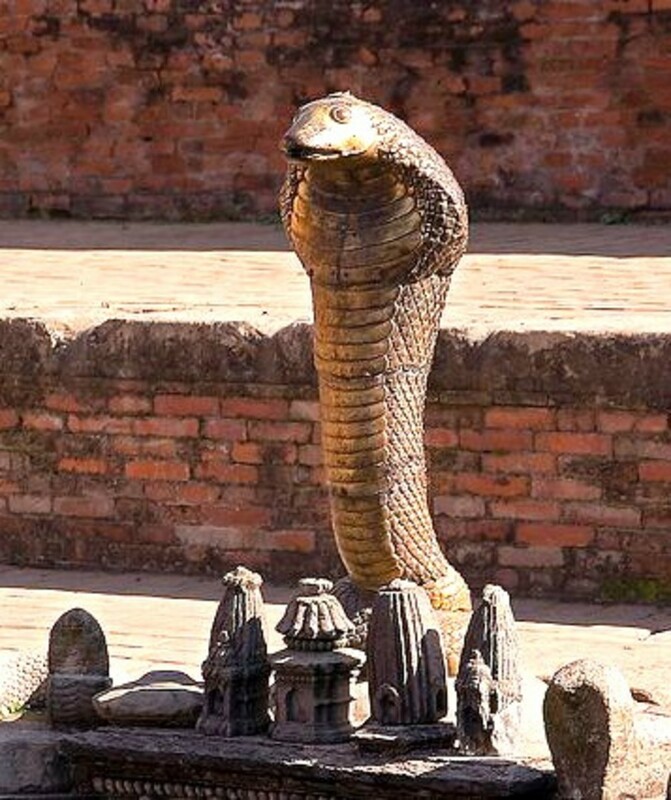 It is also used for tantric rituals. 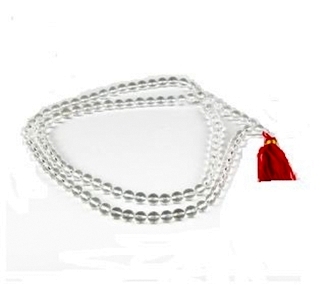 Vaijanti Mala - Vaijanti Mala is made of White beads of Vaijanti and is used for Vashikaran, Attraction and Devi Siddhi. It is also used by the devotees of Lord Vishnu and for chanting Mantras for worship of goddess Lakshmi. Chirmi Beads Mala - It is said the bead itself will choose its owner and will not stay with an unlucky person. Since the Goddess of wealth, Maha Laxmi, stay near to these Beads, these are considered very lucky and powerful. 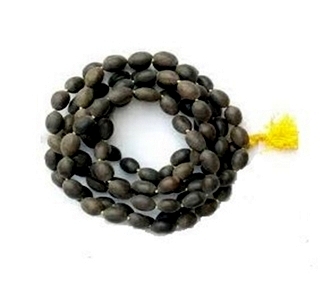 This mala can be used for Shaligram shingar too. Cowrie shells Mala – This mala is considered holy by the Hindus since vedic times and all religious ceremonies have a special place for them. 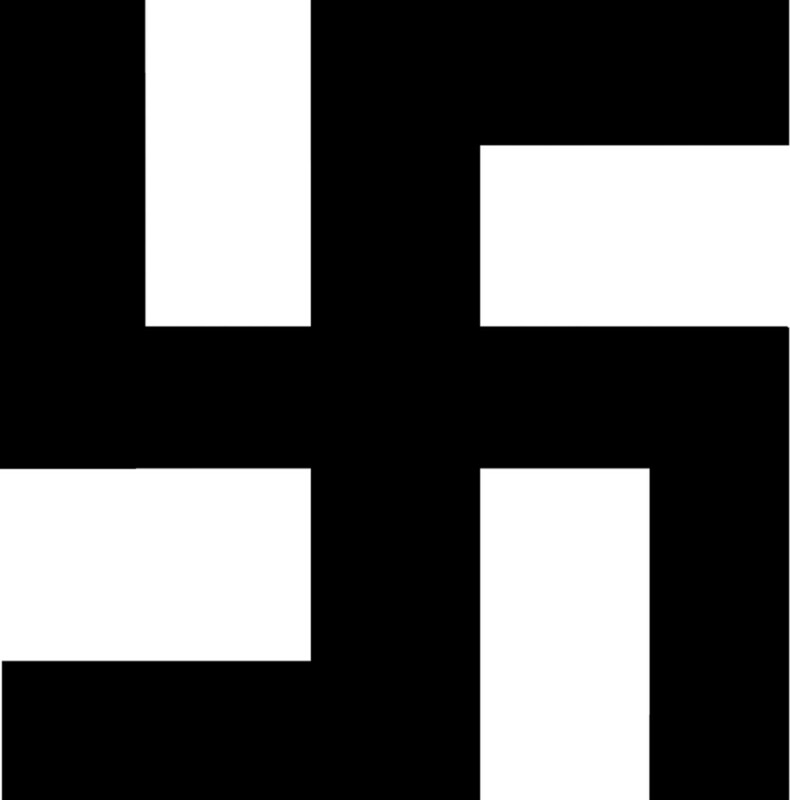 Those who want stable financial position should wear a Kauri mala. It is highly recommended for Japa of Mahalaxmi mantras. 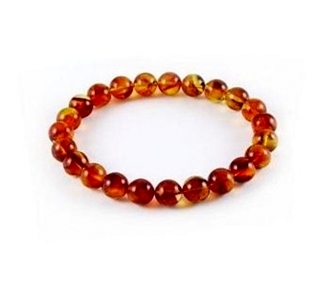 Amber Mala - Amber Mala is used especially for the "JAPA". 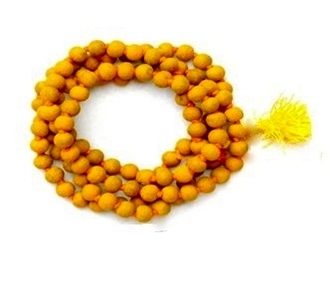 The mala contains 10 -11 mm 108 round amber beads. It is very useful in diseases related to blood and disorder in menstruation. 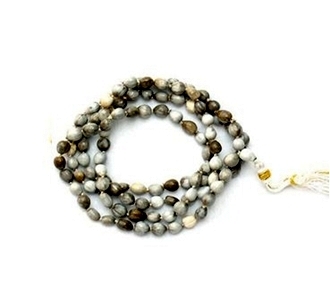 Sphatik Mala – Spatik or Crystal is the best mala for counting beads while chanting Devi Mantras. If it is worn, the mind becomes pacified and quiet. He who wears it, becomes pacified and quiet. 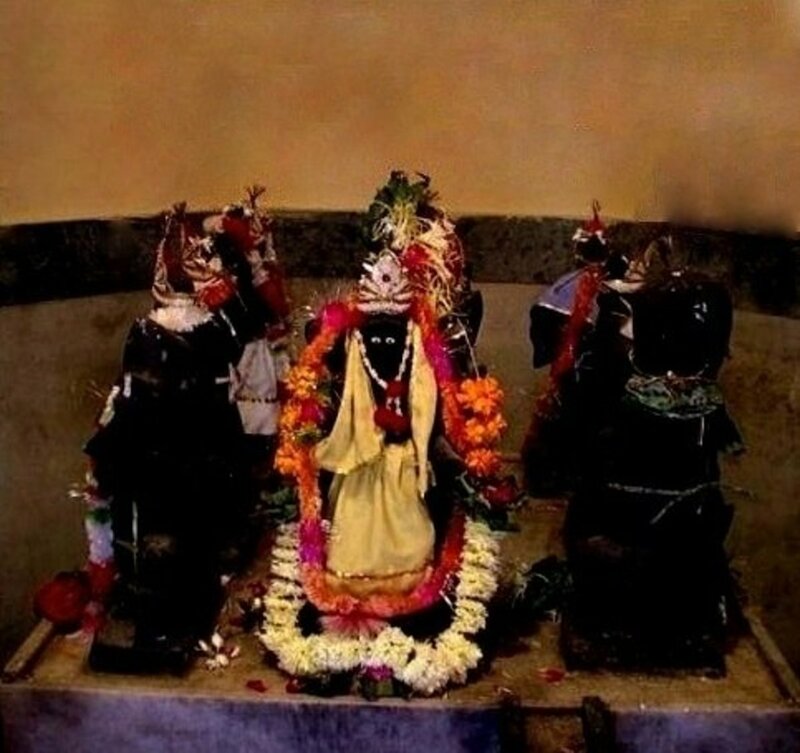 He who wears it, becomes favorite of Lord Shiva. Rudraksha Beads Rosary - It is very effective and is used in all kinds of rituals while worshiping gods, goddesses and nine planets. 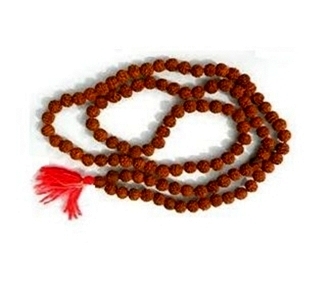 Rudraksha mala is said to have many healing properties. Rudraksha is said to be rich with shakti and calms the kundalini, thus making it easier to rise. 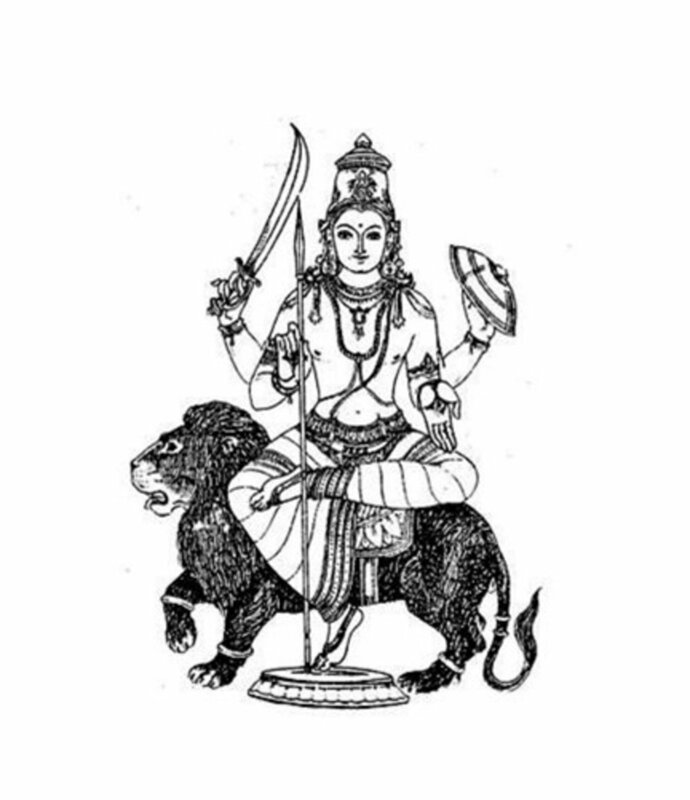 Navratna Mala - This is used to pacify nine planets. There are nine precious stones corresponding the nine planets or navagrahas in it which are Ruby (Sun), Pearl (Moon), Red coral (Mars), Emerald (Mercury), Yellow sapphire (Jupiter), Diamond (Venus), Blue Sapphire (Saturn), Hessonite (Rahu) and Cat's Eye (Ketu). How to use Prayer Beads? This Hub is very informative and looks wholesome in covering all types of Rosaries. Thanks a ton! 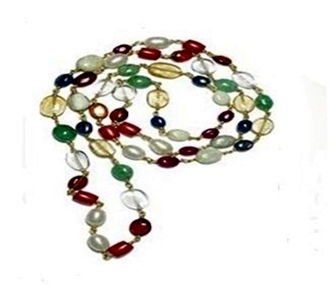 @Gaurav Kamadev Rosary or Anang Mala is used for chanting kamadeva vashikaran mantras. I only use rudraksh, coral, navaratna and crystal bead rosaries and have no idea where you can get an anang mala. 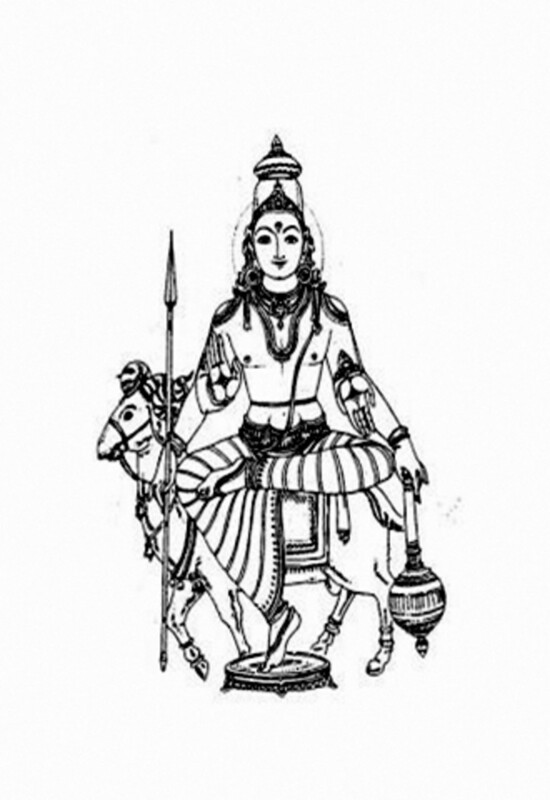 What is the rosary (mala) to Kamdev mantra? Yeah. Thanks for the comment. Japa Mala are prayer beads for the hindu religion. Chistians have their rosaries, Muslims have their own prayer beads, and the Hindus have their Japa Mala.